St. Lucia is one of the gems of the eastern Caribbean. A sovereign nation, in the Lesser Antilles, from north to south, St. Lucia is truly the island paradise vacationers dream about. Whether you’re interested in hiking through the Piton Mountains or heading to one of the island’s renowned spas, St. Lucia luxury resorts combine raw nature with sophisticated luxury. This article will show you ten of the best St. Lucia luxury resorts with 4- and 5-star ratings for all types of travelers. Unlike an ordinary hotel, luxury resorts offer a full destination experience in one package. With these resort locations, you can experience everything St. Lucia has to offer. This is the flagship location of the Bay Gardens St. Lucia luxury resorts family. Bay Gardens Beach is located in Gros-Islet at the northern tip of St. Lucia. This resort offers musical events, a water entertainment complex, and the gorgeous scenery of its location at scenic Reduit Beach. Well-regarded for its platinum-level green policies, Bay Gardens also features a world-class business center. This one is popular with Hollywood celebrities like Morgan Freeman and Harrison Ford. And the Ladera Resort is best known as a perfect destination for luxury eco-tourism for couples. The tropical-style suites feature handmade hardwood beds and open fourth walls. Ladera offers a variety of other world-class amenities and easy access to the Piton Mountains World Heritage Site. In other words, it is an excellent, luxurious resort to stay at. Located amid the glorious Piton Mountains, the Saint James’s Club Morgan Bay resort is a casual, all-inclusive location in fantastic beachfront environs. This resort offers lots of watersport facilities, such as kayaking, windsurfing, and much more, for those who want to hit the waves. For new-weds, there is everything you need for a perfect wedding. Other nearby attractions include the Rodney Bay Marina and the Cap Estate Golf Course. All this amounts to a heavenly stay at this exquisite and luxurious island resort. Ideal for families, The Landings Saint Lucia is the place for either in-depth St. Lucia experiences or for just relaxing. 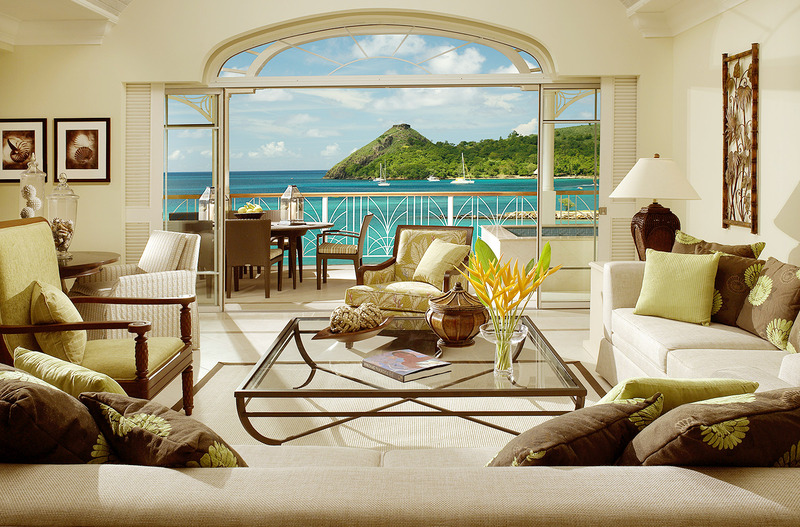 Opened in 2007, the Landings sits on the northern tip of St. Lucia among some of its most spectacular beaches. All of which offers a luxury vacation place on this tropical gem. Glorious decorated villas and sumptuous cuisine round out the experience. This is one of the best locations for a luxury experience that’s still perfect for the whole family. The East Winds resort is another Gros Islet resort, this time present on what many consider to be one of the island’s best beaches. Oriented to couples, this resort offers all-inclusive, personalizing services for discerning travelers. Its pristine, yet secluded location makes this island hideaway perfect for a relaxing getaway amid the beautiful greenery of the island. Gros Islet’s Cap Maison Resort and Spa is another gem on glorious Rodney Bay. Set on its own hidden beach, this family-friendly resort has easy access to one of the island’s premier country clubs. Villa-style private suites and some of the best food in St. Lucia make a stay here almost like a visit to a dear friend. Guests were impressed with the quality of service and accommodation. The Sugar Beach resort is set within a 100-acre rainforest. It neighbors a sugar plantation from the 18th century, which embraces the Pitons. Nestled near a UNESCO World Heritage natural monument, the grounds go down to the white sandy Sugar Beach and the dazzling Caribbean Sea. You can enjoy select drinks under the almond trees, or discover the sophisticated nightlife at the Palm Court Lounge. Relax at their St. Lucia spa service or enjoy some Yoga classes or water sports. Anything is possible in this lush tropical paradise. Enjoy their “rummelier” services, explore the natural marvels of this UNESCO heritage landscape. And convince yourself reading these guests impressions after their stay here. From the renowned resort company Sandals, Halcyon Beach Resort offers peace and tranquility for couples near the island’s capital, Castries. The proximity of the city does nothing to distract from the peaceful and isolated feel of this all-inclusive resort nestled on one of the most pristine beaches in St. Lucia. Guests felt like home at this luxury resort in St. Lucia. Read and see why. For adult guests only, Ti Kaye is the perfect getaway for couples in St. Lucia. Each residence is a purpose-built cottage naturally set into the local landscape. Suites come equipped with hammocks, outdoor showers, and personal pools. Guests can also enjoy breathtaking balcony views of nearby Anse Chochon cove. This stylishly designed luxury resort is a special place, and it can be even considered a hidden oasis. That’s what guests say that this gem among these St. Lucia luxury resorts is. Set in a landscape praised by the American novelist James Michener, Capella Marigot features an all-inclusive luxury for everyone. Guests can enjoy the marina with its world-class shops and restaurants or relax in the resort’s extensive spa facilities. Accommodations are set against the forested hillside. Thus offering a truly immersive island experience. Secluded, intimate, tranquil, and top-notch is how guests describe this splendid St. Lucia resort. An all-inclusive resort experience on St. Lucia is more than a vacation. These well-appointed St. Lucia luxury resorts combine the best of the full-service resort experience with the unspoiled nature of the St. Lucia countryside. Whether you’re looking for a getaway for a couple or the whole family, this jewel of the islands has something for you. Have you found paradise in one of these St. Lucia luxury resorts? Share your thoughts and experiences with us! And don’t forget to subscribe to our newsletter for more Route 4 Us top luxury hotels.